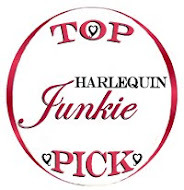 the 2015 Readers' Choice Award for Best Romance. Spring means long walks in the park, smelling those newly-bloomed hyacinths… and pulling out the grill! 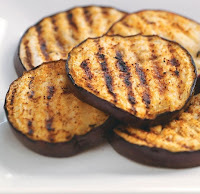 One of my favorite springtime meals is a simple plate of grilled vegetables. It doesn’t matter if you use a grill pan or a hinged basket or simply place the veggies directly on the grill’s grate. 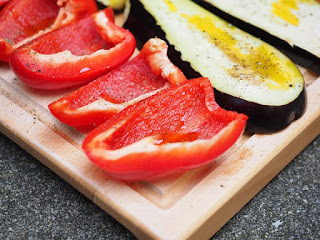 The key is in slicing the vegetables to the same thickness and size so they cook evenly… and don’t over cook. You want a little scorching for flavor, but you also want to keep some of that fresh crispness. This recipe is delicious, and so easy! 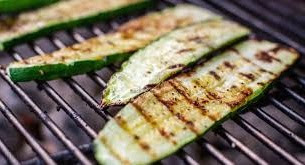 Just choose your favorite veggies, season well with oil and spices, and toss them on a hot grill. What are you waiting for? 1. Wash vegetables and pat dry. 3. Brush with oil and season on all sides. Place all spices in a glass jar, cover, and shake to combine. Keeps several weeks in an airtight container. Try swapping out the spices listed for those you like—cumin, smoked paprika, lemon pepper, cayenne, etc—or spice blends such as Italian Seasoning or Seasoned Salt. With spices, the sky is the limit! 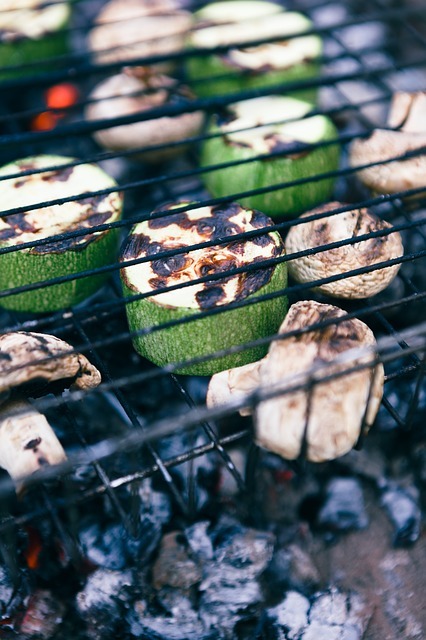 Labels: Easy Recipes for the Grill, Grilled Vegetables, What's for dinner? First Announcement: A New Release! 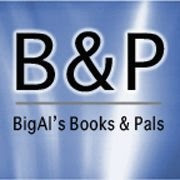 Second Announcement: A 99¢ Sale! 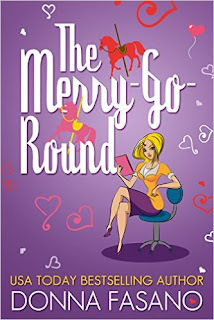 My romantic comedy/contemporary romance THE MERRY-GO-ROUND is on sale for under $1! Save $3! 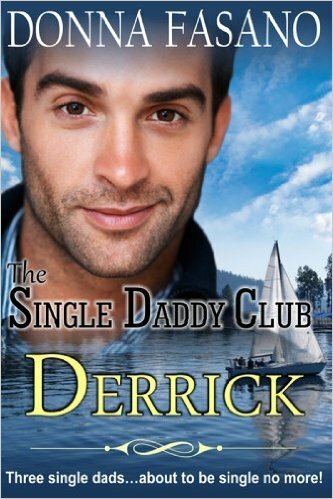 This book is only available in the Kindle Store. Readers have called this book "engaging" and a "must-read." The Wilmington News Journal calls it "funny and realistic." If you haven't read it yet, now's your chance to enjoy this cute story AND save some money. 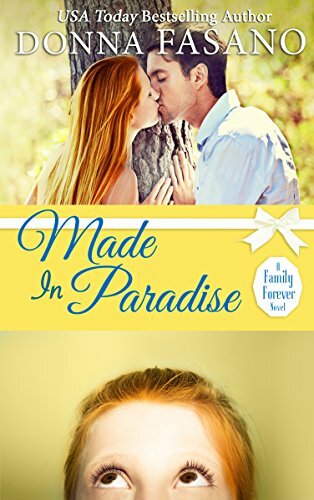 Labels: @DonnaFaz, 99¢ Kindle Books, A Family Forever Series, Donna Fasano, Made In Paradise, New Release, The Merry-Go-Round, What are the best sweet romance novels? Yesterday, I fiddled with my applesauce cake recipe and came up with this delicious confection. I hope you’ll try it. If you don’t have coconut oil on hand, just double the amount of vegetable oil. 1. Pre-heat oven to 350º. Spray a 13” x 9” baking pan with cooking spray and set aside. 2. Stir together the flour, baking soda, salt, baking powder, cinnamon, ginger, and cardamom. 3. In a separate bowl, stir together the sugar, applesauce, water, coconut oil, vegetable oil, molasses, and eggs. Mix until well combined. 4. Mix the dry ingredients with the wet ingredients, beating only until flour mixture is incorporated. Do not over mix. 5. Add the raisins and the nuts and stir to combine. Scrape batter into cake pan, smooth into an even layer, and bake for 55-65 minutes. At 55 minutes, poke center of cake with a wooden toothpick. Keep checking every 5 min. When toothpick comes out clean, the cake is done. Let cool. I topped this cake with a simple cream cheese icing. I had a 4 ounce package of cream cheese that I brought to room temperature. I combined the cream cheese with a heaping cup of powdered sugar and added a splash of milk to make the mixture a spreadable consistency. This cake is perfect with a cup of hot tea or coffee. 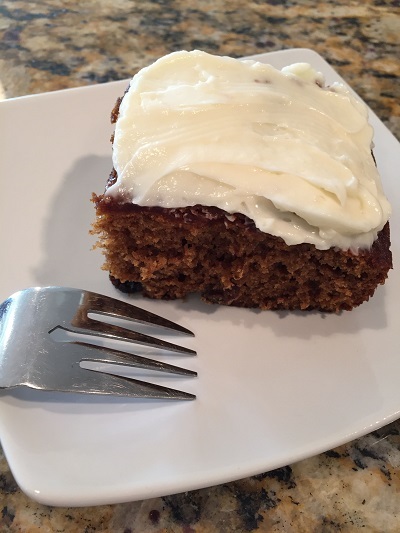 Labels: applesauce cake, recipes, rich applesauce cake, What's for dessert?